3 Based on: Dörnyei, Z. (2005). The psychology of the language learner: Individual differences in second language acquisition. Mahwah, NJ: Lawrence Erlbaum. Dörnyei, Z. (in press). 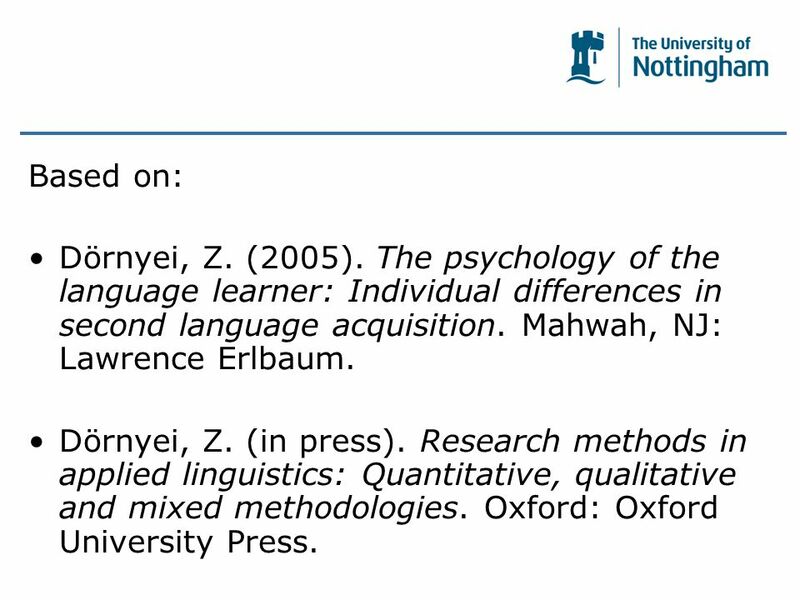 Research methods in applied linguistics: Quantitative, qualitative and mixed methodologies. Oxford: Oxford University Press. 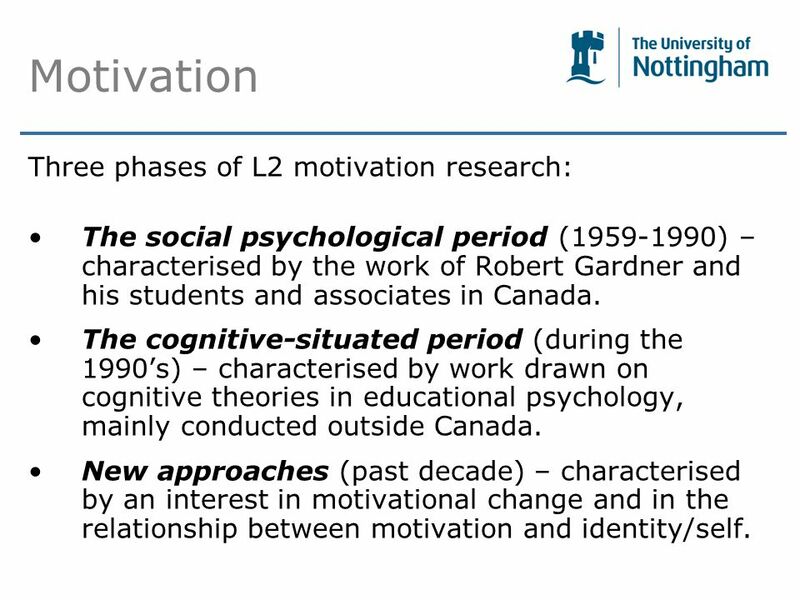 4 Motivation Three phases of L2 motivation research: The social psychological period (1959-1990) – characterised by the work of Robert Gardner and his students and associates in Canada. The cognitive-situated period (during the 1990’s) – characterised by work drawn on cognitive theories in educational psychology, mainly conducted outside Canada. New approaches (past decade) – characterised by an interest in motivational change and in the relationship between motivation and identity/self. 5 Social psychological period  Motivation research was inspired and spearheaded by social psychologist Robert Gardner in Canada. 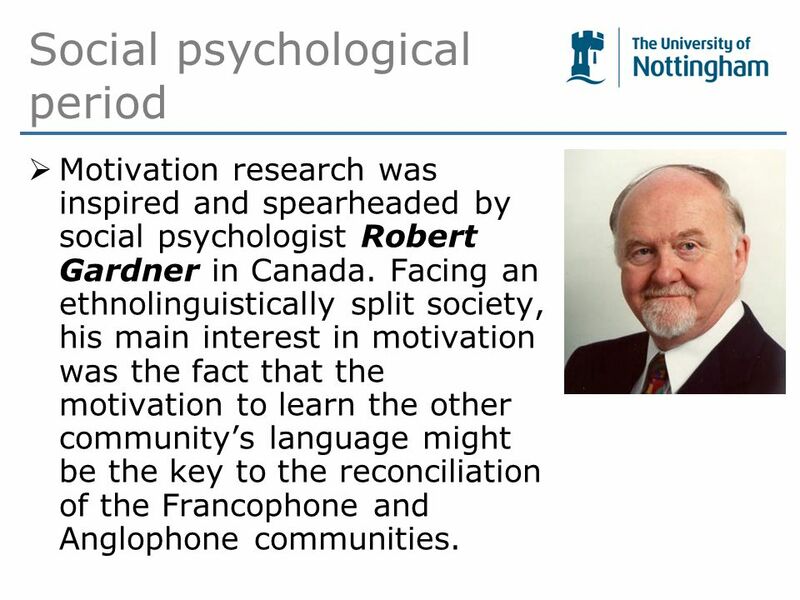 Facing an ethnolinguistically split society, his main interest in motivation was the fact that the motivation to learn the other community’s language might be the key to the reconciliation of the Francophone and Anglophone communities. 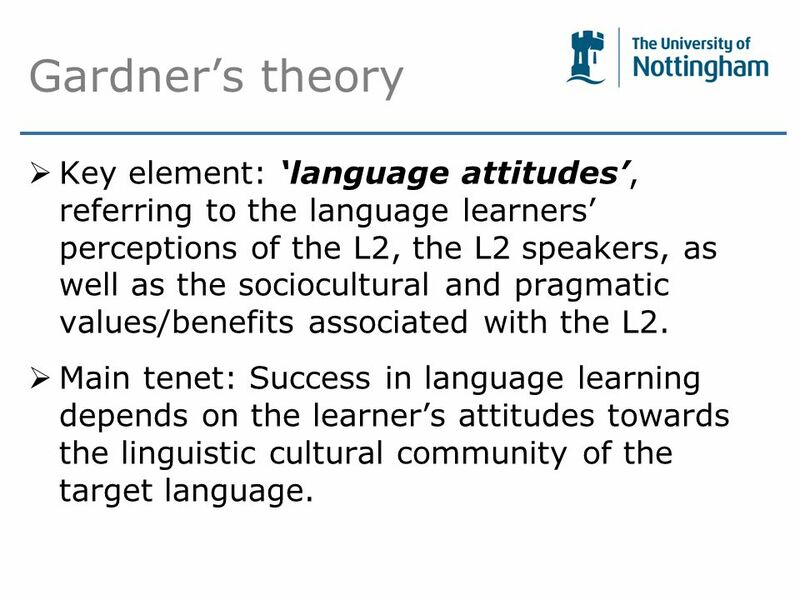 6 Gardner’s theory  Key element: ‘language attitudes’, referring to the language learners’ perceptions of the L2, the L2 speakers, as well as the sociocultural and pragmatic values/benefits associated with the L2.  Main tenet: Success in language learning depends on the learner’s attitudes towards the linguistic cultural community of the target language. 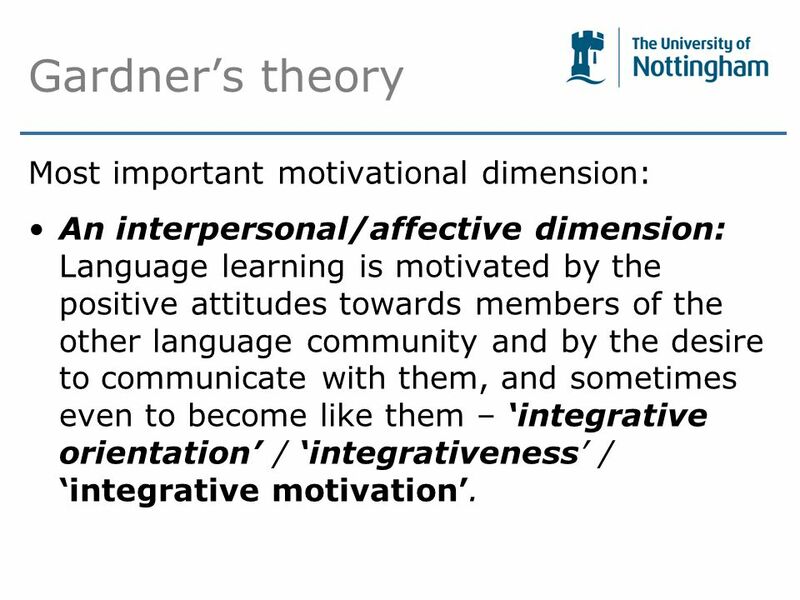 7 Gardner’s theory Most important motivational dimension: An interpersonal/affective dimension: Language learning is motivated by the positive attitudes towards members of the other language community and by the desire to communicate with them, and sometimes even to become like them – ‘integrative orientation’ / ‘integrativeness’ / ‘integrative motivation’. 8 Cognitive-situated period  The 1990’s brought about a general dissatisfaction with the scope of Gardner’s theory. 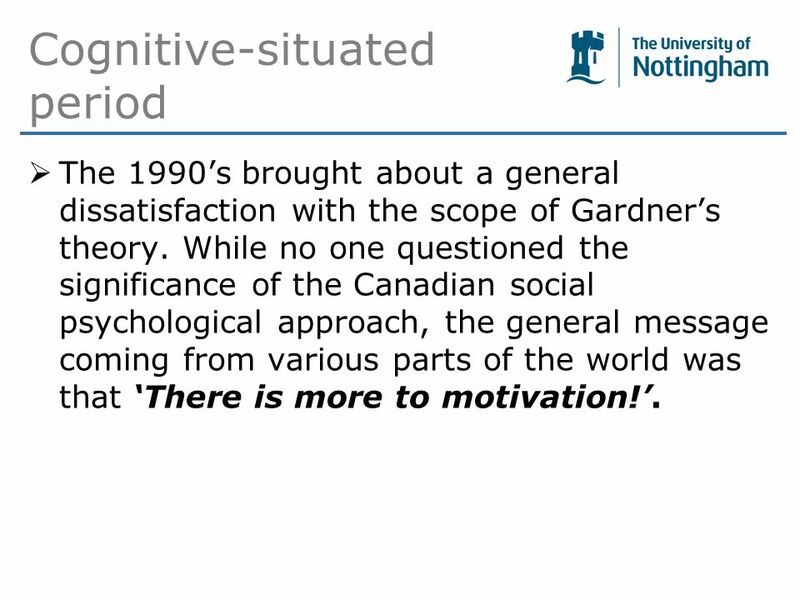 While no one questioned the significance of the Canadian social psychological approach, the general message coming from various parts of the world was that ‘There is more to motivation!’. 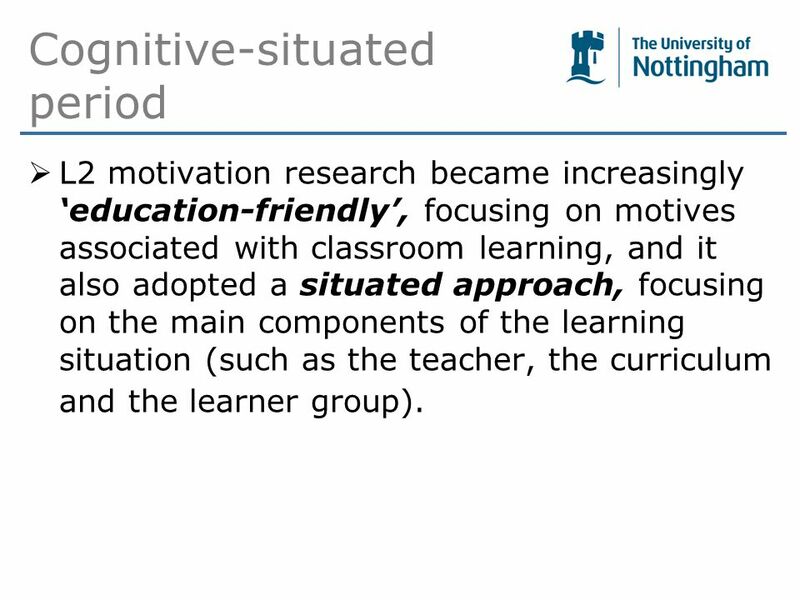 9 Cognitive-situated period  L2 motivation research became increasingly ‘education-friendly’, focusing on motives associated with classroom learning, and it also adopted a situated approach, focusing on the main components of the learning situation (such as the teacher, the curriculum and the learner group). 10 New approaches 1. A process-oriented approach attempts to account for the ongoing changes of motivation over time. 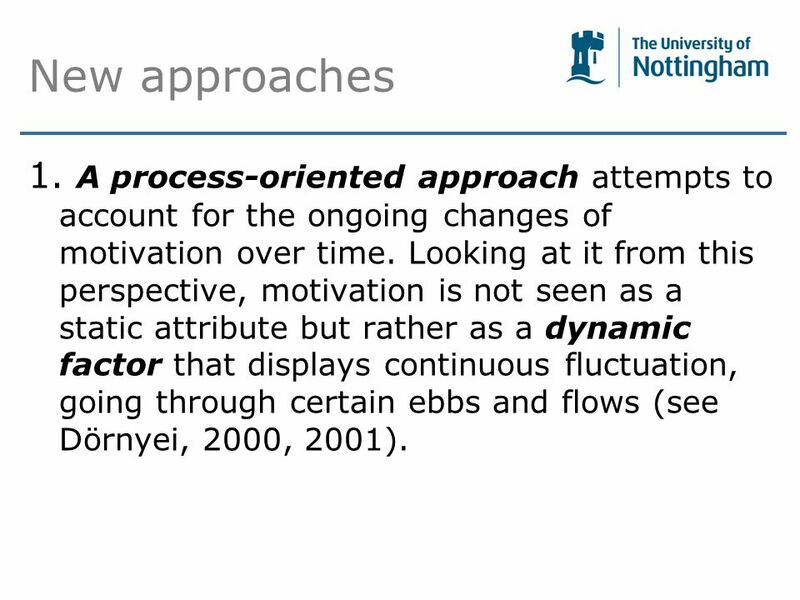 Looking at it from this perspective, motivation is not seen as a static attribute but rather as a dynamic factor that displays continuous fluctuation, going through certain ebbs and flows (see Dörnyei, 2000, 2001). 11 New approaches 2. 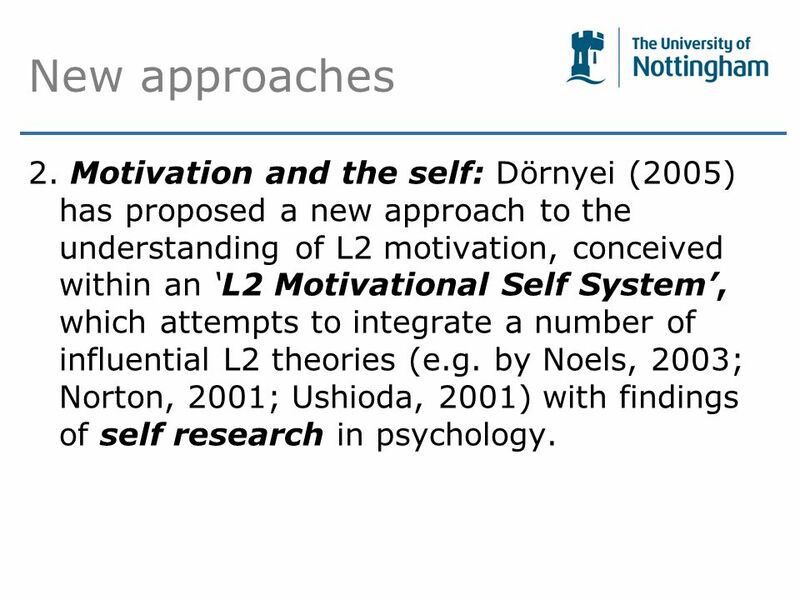 Motivation and the self: Dörnyei (2005) has proposed a new approach to the understanding of L2 motivation, conceived within an ‘L2 Motivational Self System’, which attempts to integrate a number of influential L2 theories (e.g. by Noels, 2003; Norton, 2001; Ushioda, 2001) with findings of self research in psychology. 12 L2 Motivational Self System  Key tenet: ‘Integrativeness/integrative motivation’ is equated with the ‘Ideal L2 Self’.  The Ideal L2 Self refers to the L2-specific facet of one’s ‘ideal self’, which is the representation of all the attributes that a person would like to possess (e.g. 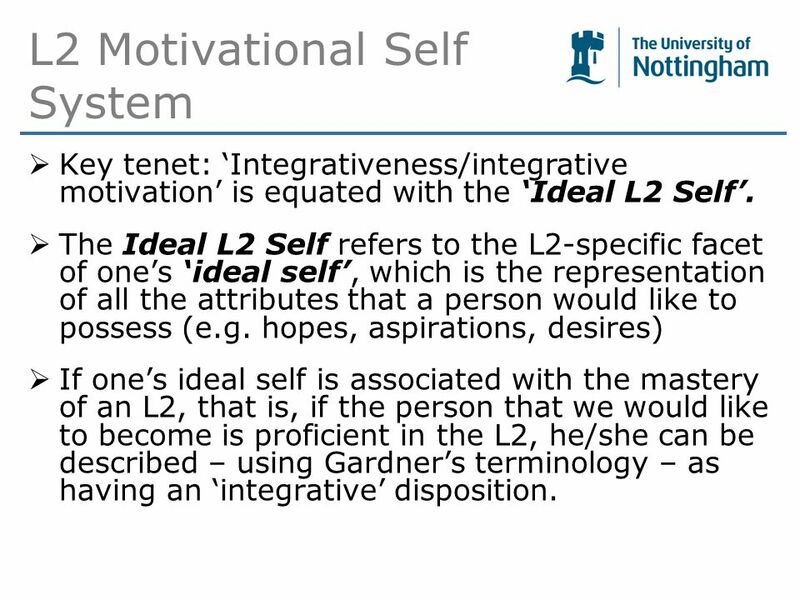 hopes, aspirations, desires)  If one’s ideal self is associated with the mastery of an L2, that is, if the person that we would like to become is proficient in the L2, he/she can be described – using Gardner’s terminology – as having an ‘integrative’ disposition. 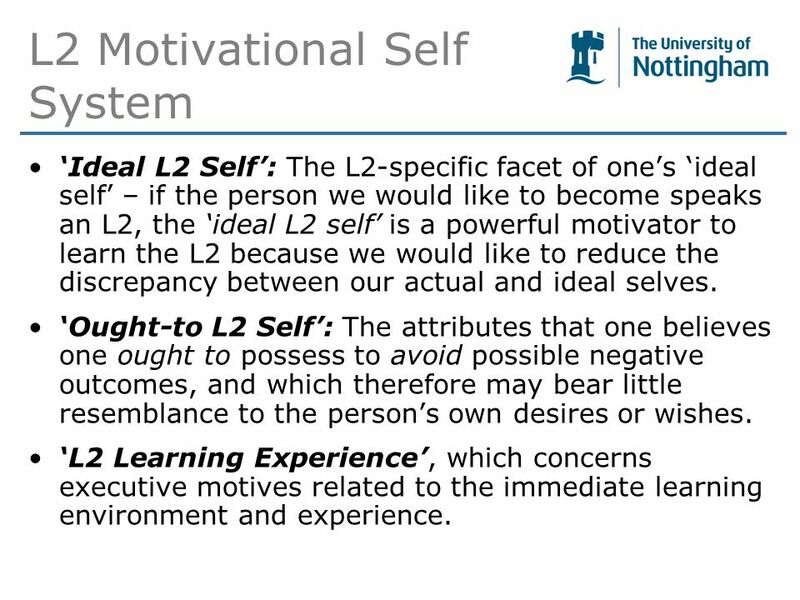 13 L2 Motivational Self System ‘Ideal L2 Self’: The L2-specific facet of one’s ‘ideal self’ – if the person we would like to become speaks an L2, the ‘ideal L2 self’ is a powerful motivator to learn the L2 because we would like to reduce the discrepancy between our actual and ideal selves. ‘Ought-to L2 Self’: The attributes that one believes one ought to possess to avoid possible negative outcomes, and which therefore may bear little resemblance to the person’s own desires or wishes. ‘L2 Learning Experience’, which concerns executive motives related to the immediate learning environment and experience. 17 Mixed methods research Mixing methods is not good per se; in fact, it can be a distraction to serious research. However, certain principled mixtures can combine different methods in such a way that their strengths are added up, thereby making the sum greater than the parts. 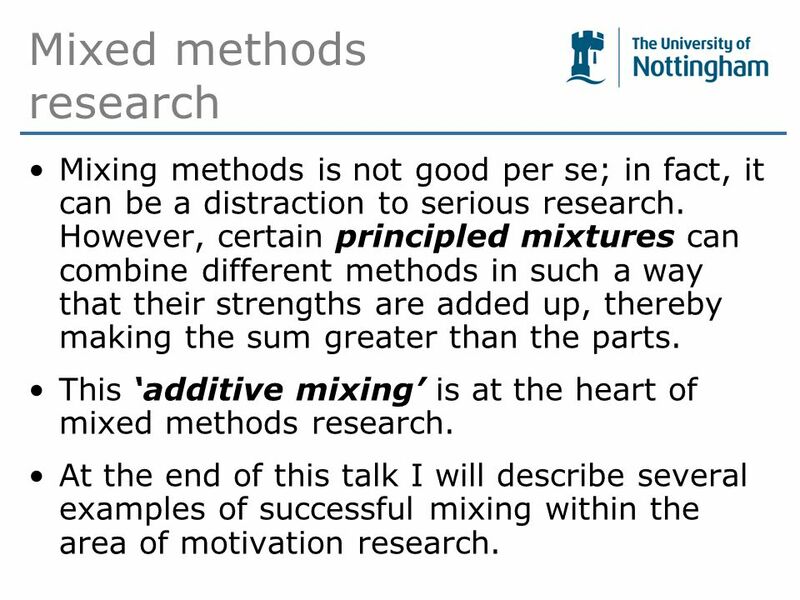 This ‘additive mixing’ is at the heart of mixed methods research. At the end of this talk I will describe several examples of successful mixing within the area of motivation research. 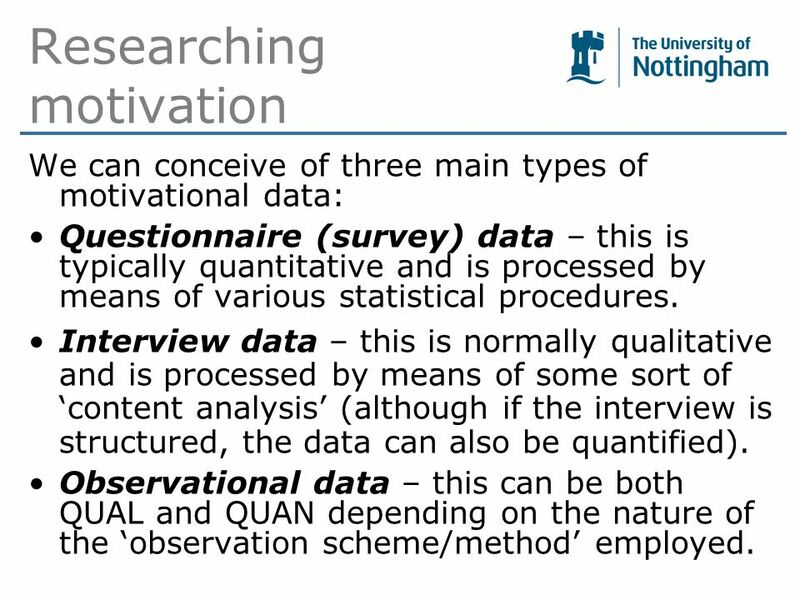 18 Researching motivation We can conceive of three main types of motivational data: Questionnaire (survey) data – this is typically quantitative and is processed by means of various statistical procedures. Interview data – this is normally qualitative and is processed by means of some sort of ‘content analysis’ (although if the interview is structured, the data can also be quantified). 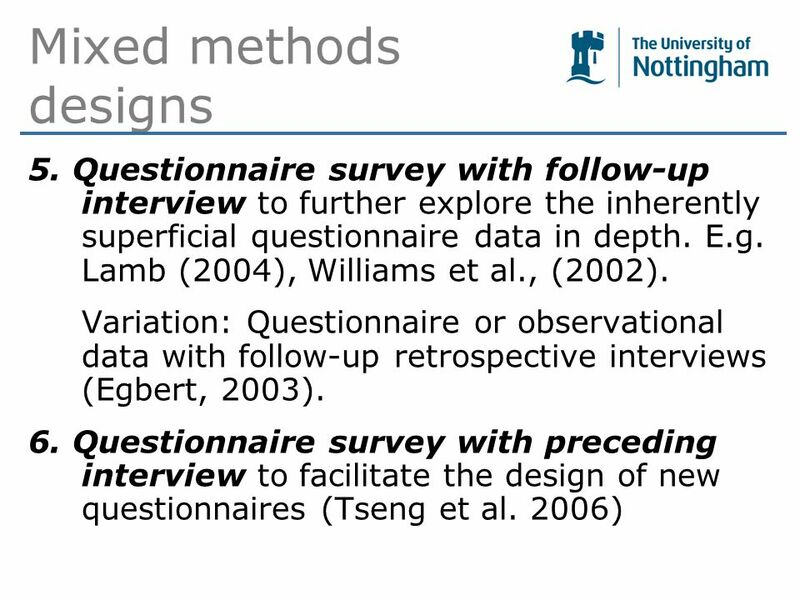 Observational data – this can be both QUAL and QUAN depending on the nature of the ‘observation scheme/method’ employed. 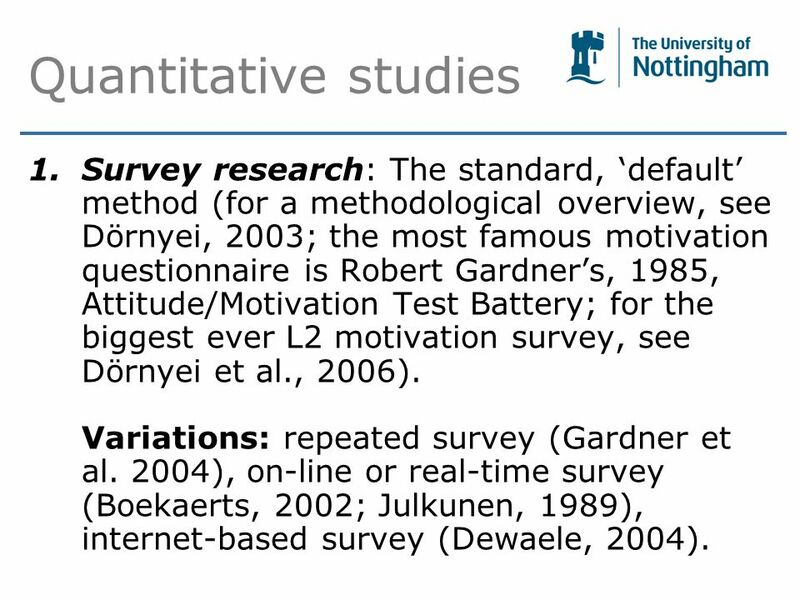 19 Quantitative studies 1.Survey research: The standard, ‘default’ method (for a methodological overview, see Dörnyei, 2003; the most famous motivation questionnaire is Robert Gardner’s, 1985, Attitude/Motivation Test Battery; for the biggest ever L2 motivation survey, see Dörnyei et al., 2006). Variations: repeated survey (Gardner et al. 2004), on-line or real-time survey (Boekaerts, 2002; Julkunen, 1989), internet-based survey (Dewaele, 2004). 20 Quantitative studies 2. 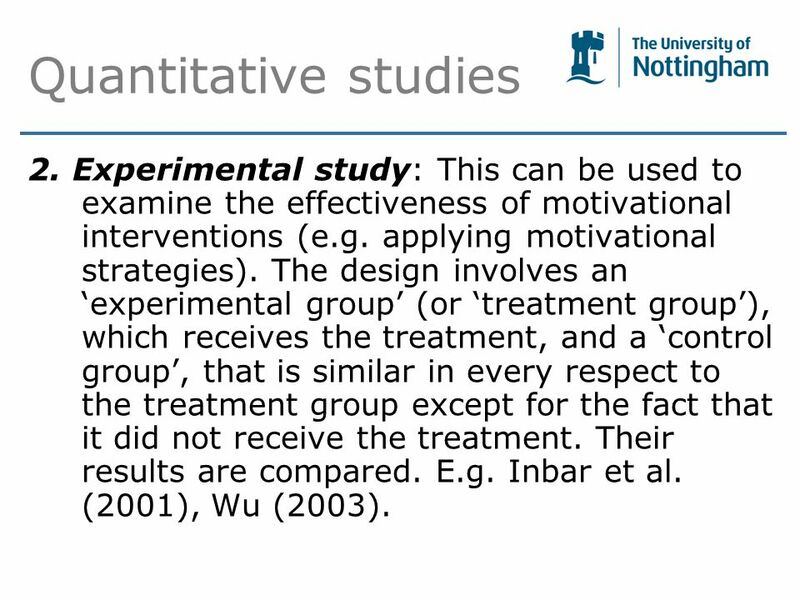 Experimental study: This can be used to examine the effectiveness of motivational interventions (e.g. applying motivational strategies). The design involves an ‘experimental group’ (or ‘treatment group’), which receives the treatment, and a ‘control group’, that is similar in every respect to the treatment group except for the fact that it did not receive the treatment. Their results are compared. E.g. Inbar et al. (2001), Wu (2003). 21 Qualitative studies 3. 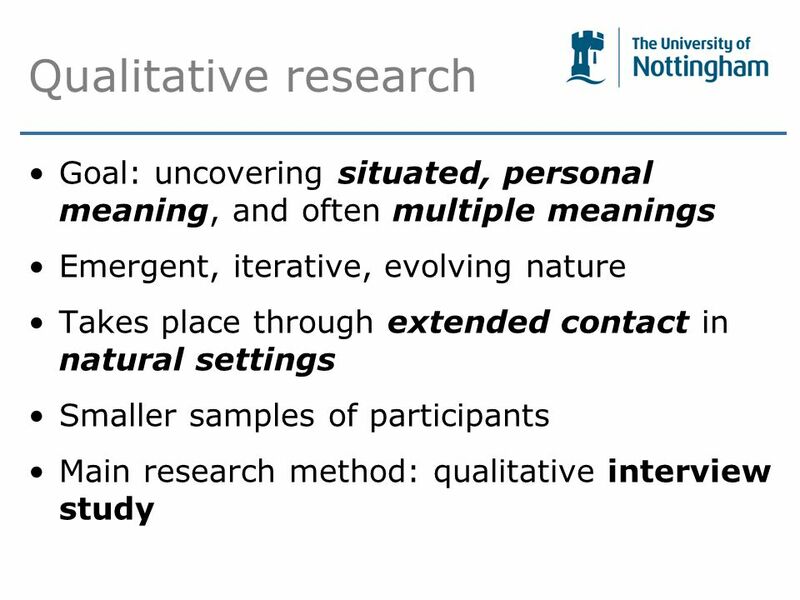 Interview study: Questionnaire cannot do the complexity of situated studies (e.g. classroom research) full justice because of the small sample sizes and the many important idiosyncratic variables. 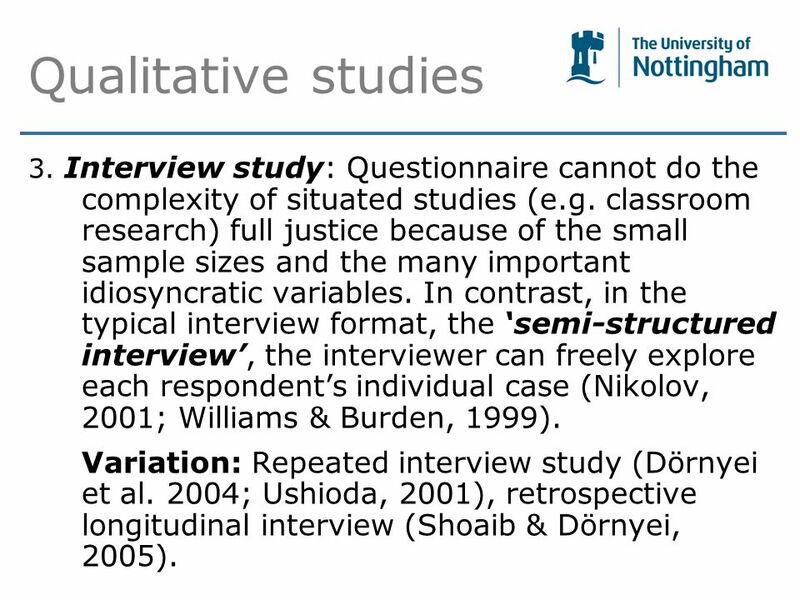 In contrast, in the typical interview format, the ‘semi-structured interview’, the interviewer can freely explore each respondent’s individual case (Nikolov, 2001; Williams & Burden, 1999). Variation: Repeated interview study (Dörnyei et al. 2004; Ushioda, 2001), retrospective longitudinal interview (Shoaib & Dörnyei, 2005). 22 Mixed methods designs 4. 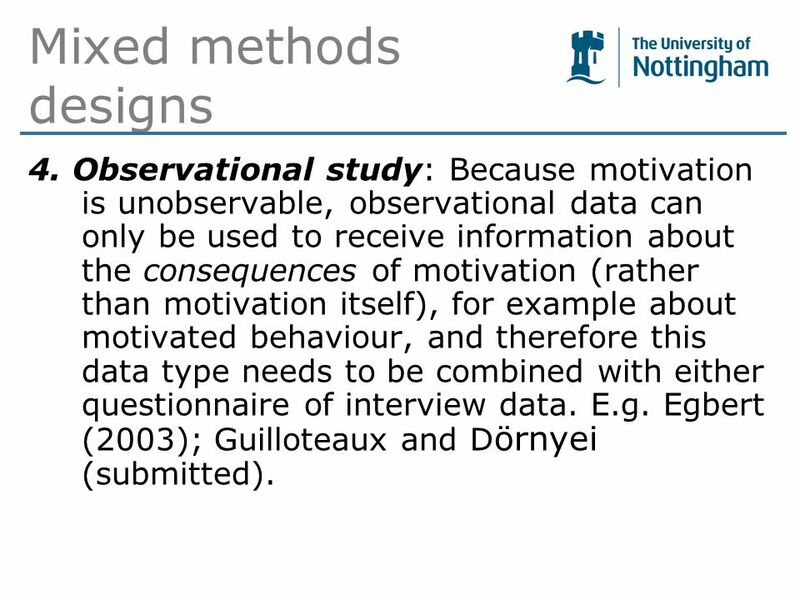 Observational study: Because motivation is unobservable, observational data can only be used to receive information about the consequences of motivation (rather than motivation itself), for example about motivated behaviour, and therefore this data type needs to be combined with either questionnaire of interview data. E.g. Egbert (2003); Guilloteaux and D örnyei (submitted). 24 Mixed methods designs 7. Interview study with follow-up questionnaire to test the generalisability of the findings of the interview (Edwards, 2006). 8. 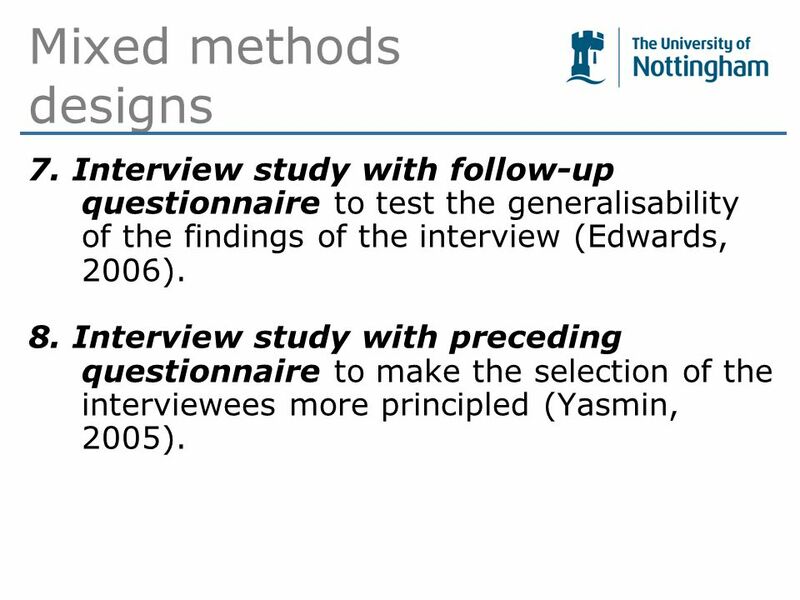 Interview study with preceding questionnaire to make the selection of the interviewees more principled (Yasmin, 2005). 25 Mixed methods designs 9. 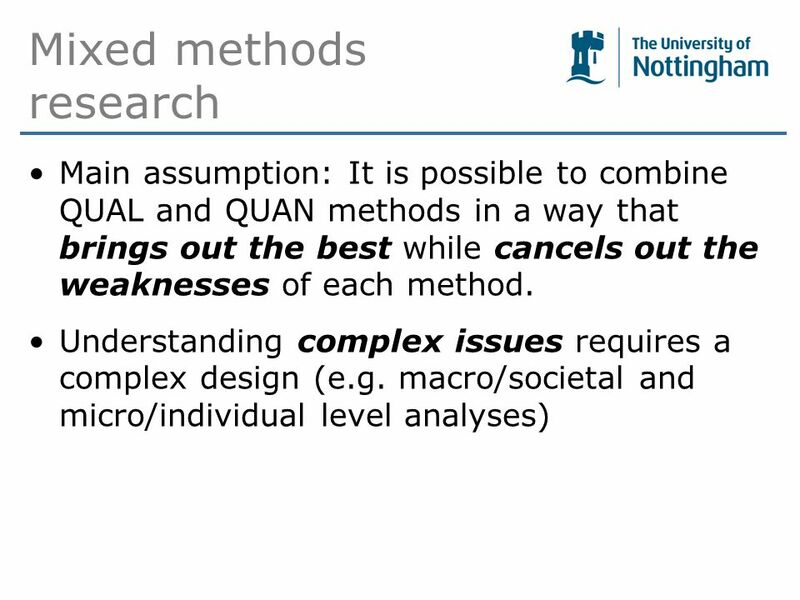 Concurrent combinations of QUAL and QUAN research to (a) examine how different findings complement or corroborate each other (i.e. 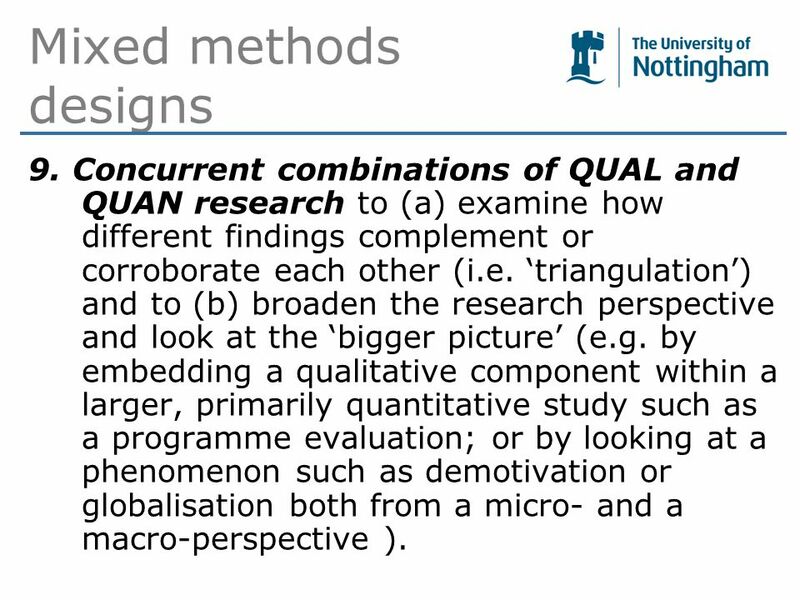 ‘triangulation’) and to (b) broaden the research perspective and look at the ‘bigger picture’ (e.g. by embedding a qualitative component within a larger, primarily quantitative study such as a programme evaluation; or by looking at a phenomenon such as demotivation or globalisation both from a micro- and a macro-perspective ). 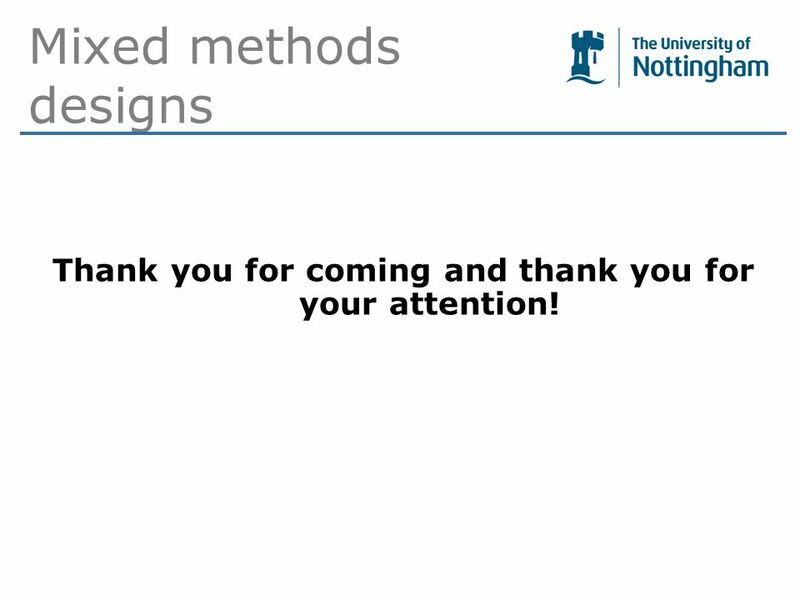 26 Mixed methods designs Thank you for coming and thank you for your attention! 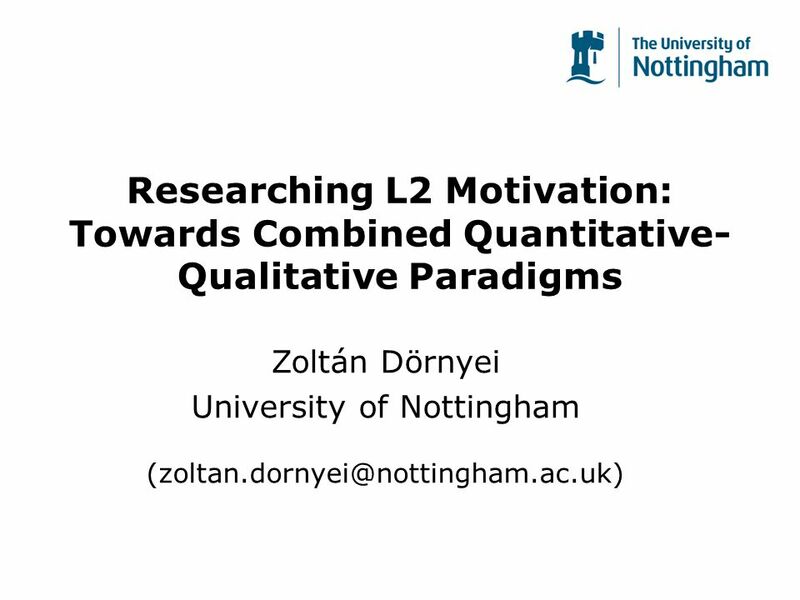 Download ppt "Researching L2 Motivation: Towards Combined Quantitative- Qualitative Paradigms Zoltán Dörnyei University of Nottingham"
Mixed methods in longitudinal research Nick Buck UK Longitudinal Studies Centre University of Essex. 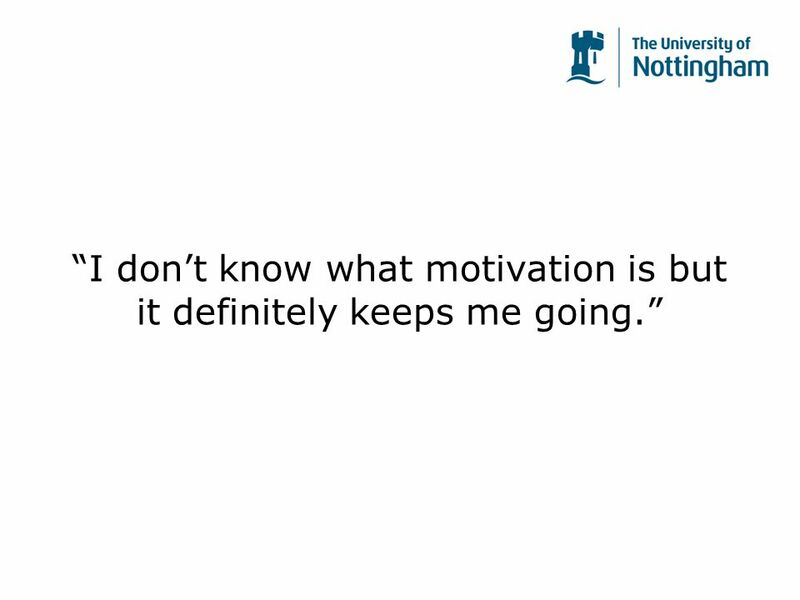 Motivation and identity in language learning: current perspectives Ema Ushioda Centre for Applied Linguistics University of Warwick. Zoltán Dörnyei (University of Nottingham) Instructed second language acquisition from a complex dynamic systems perspective. Presented by Dr. Shiv Ram Pandey. HOW CAN CT AID IN THE INVESTIGATION OF INDIVIDUAL DIFFERENCES IN ADDITIONAL LANGUAGE LEARNING? Zoltán Dörnyei University of Nottingham. IGNITING THE VISION: Guiding students to imagine the ideal L2 self Katie Butler & Virginia Scott Vanderbilt University ACTFL 2014. Language Learner Perceptions of Technology-Based Tasks Using Wimba Voice: L2 Oral Proficiency, Motivation, and L2 Selves Jesse Gleason and Ruslan Suvorov. Faculty of Education and Social Work Investigating Motivational Teaching Strategies and Teacher Self- Evaluation in Adult English Language Classrooms in. Alternative Assesment There is no single definition of ‘alternative assessment’ in the relevant literature. For some educators, alternative assessment. What can teachers / learners do? Chapter Overview 1. Learner characteristics 2. Learner styles 3. Learner strategies 4. Learner motivation Cohen, Andrew. Research in Language Learning and Teaching Short introduction to research and its planning. A Behavioral Science and Research Perspective. What Behavioral sciences do you think are involved to Organizational Behavior?